Photo by Darren Andrew Weimert Lawrence Lokman, Penn State’s vice president for strategic communications, talks with Town&Gown founder Mimi Barash Coppersmith at Legends Restaurant at the Penn Stater Hotel & Conference Center. As vice president for strategic communications since October 2014, Lawrence Lokman is charged with advancing and protecting Penn State’s reputation for excellence and integrity. His responsibilities include media relations, executive positioning, crisis communications, social media, enrollment marketing, visual identity, branding, and advertising. Since his arrival, he has begun to highlight some of the opportunities at this great public research university through storytelling. He brings more than 25 years of experience in the public and private sectors developing local, state, and national public affairs and image-improvement campaigns. He was the founder and managing director of Window In Communications, a strategic communications consultancy focused on major education and cause-based enterprises with clients including Conrad N. Hilton Foundation, Cedars-Sinai Medical Center, Stanford, and California Coalition for Public Higher Education. Prior to coming to Penn State, Lokman was associate vice chancellor in charge of communications for UCLA, where he introduced a series of nationally acclaimed brand and advocacy campaigns profiled in Businessweek, The Wall Street Journal, and Ad Age. Born and raised in Los Angeles, Lokman is a soccer fanatic who is fluent in Hebrew because he earned his Bachelor of Arts degree in international relations from the Hebrew University of Jerusalem, graduating in 1988. He has been married for 28 years to Rhonda Seaton, who is marketing communications director for AccuWeather. His son, David, just finished his first year at Penn State, and his daughter, Olivia, graduated from State High and will be attending the University of Denver. 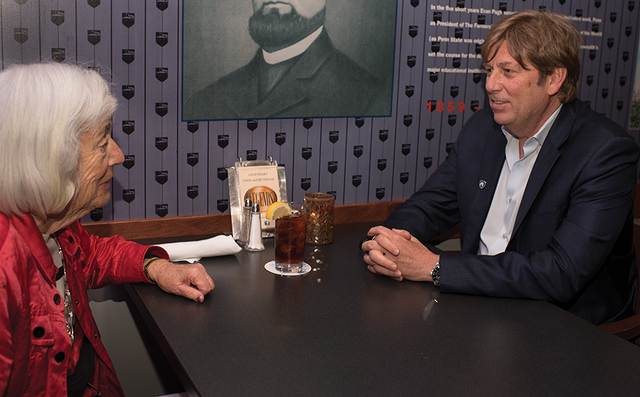 Town&Gown founder Mimi Barash Coppersmith sat down with Lokman at Legends Restaurant at The Penn Stater Hotel & Conference Center to discuss his adjustment to State College from Los Angeles, what he hopes to accomplish, and how he is working toward achieving those goals at Penn State. Mimi: The transition from Los Angeles to State College, from UCLA to Penn State, what was that like for you? Lawrence: Well, it was quite a change from a city like Los Angeles to State College, but I was very comfortable with it. I picked up a sense of community here through the process of interviews, meeting and talking to people. I was a little tired of the traffic and congestion in Los Angeles, and I was excited by a change of environment. It was an adventure, and I've always liked adventures. Mimi: You follow two, what I would consider to be, failed efforts to rebrand the university after a terrible tragedy. What was the toughest part of that? Lawrence: I have to tell you, as soon as I began to really get to know the university through the process of interviews and talking to people, I realized that it was a special opportunity. I was initially attracted in part because of what I do, reputation building, so that intrigued me. But then I started to look closely at Penn State and I thought, what an opportunity, because of the scale of the research enterprise and the university and the way it helps communities and first-generation families. The university is even better than its fine reputation for quality. The only way to go is up. So, I kind of hit the ground running and was excited to delve into the job. Mimi: You really got started by storytelling, telling the stories of Penn State. Lawrence: That's the opportunity of a great public research university. There are people pushing the bounds of knowledge in law, public health, STEM disciplines, and driving excellence in athletics programs. So, all of that boils down to an opportunity to really focus on storytelling. I really looked at it and I said, “OK, the research enterprise has been under-promoted.” There's an opportunity to do storytelling, but in the context of the ways in which the research changes and benefits communities. That can be linked to supporting fundraising and advocacy for dollars from state government. And it can support volunteer engagement. What I started to look at was, how through public relations and marketing can we create what I call a river of content, a flow of storytelling through many different channels? With the digital world, there are lots of ways to reach people, but we needed to do it in ways that were measurable and could increase the propensity of people to give or volunteer or advocate. Mimi: So, how are you doing? We just completed a post-survey, having produced and placed television, print, radio, social and digital media stories. I just spoke with our opinion researchers; they're crunching the final numbers now, so I don't have the full report. What they have shared with me is that when they compared people who were exposed to the storytelling, compared to people who didn't see it, there's a significant increase in feeling Penn State is making a difference in their lives on issues they care about: health, economic development, educational opportunity. So, there's a comparative basis to say, yes, the communications increased significantly the number of people who understand the importance of the university to their lives, whether or not they have a kid who learns here, whether or not they studied here. They also found increases in self-reported interest in giving, volunteering or advocating for the university, and greater appreciation for the importance of our research to society. Mimi: How big of a staff do you have? Lawrence: I have 55 people divided between the media unit, which handles proactive media placements, crisis communications, and issues management; internal communications like Penn State Today; and social media accounts, Facebook, Twitter, YouTube, Instagram, Snapchat. On the marketing side, that unit is responsible for brand and visual identity, advertising and web development. We also have a small campus and community events office that organizes commencements and logistically supports 4thFest and Festival of the Arts. Mimi: Do you do most of your work internally? Lawrence: For major advertising, we use an outside firm. We also do in-house design and creative development. Mimi: How do you handle it? Lawrence: I have to focus my time on strategic goals, measurement and outcomes, because we're too big and my team doesn't need me to try to micromanage all that goes on. So I really focus on the broader parameters, and then look at what tools does my team have and need to do their jobs successfully. In a digital age, to do media placement, for example, you have to have the capacity to do infographics and video snippets, and utilize Twitter, not just news releases. I look to ensure we have a mix of people on the team with varied experience. Then, how are they working with each other, to put all of those elements together. And I have good team leaders in place to help get us there. Mimi: What's the biggest hurdle you've had to overcome since you've gotten here? Lawrence: I think it's staying focused on the positive storytelling. There are so many issues and crises that a university of our size, no matter the university, faces. It can be a challenge ensuring that people aren't getting pulled away from positive storytelling. That's an important challenge that I focus on. Mimi: What's the challenge in dealing with people that no matter how positive the news, want to rain on the parade? Lawrence: The first year-and-a-half to two years I was here, the number of issues that were Sandusky-related that were still in the news was very significant. That was certainly a challenge for the university, especially in my role where you really want to stay focused on talking about research, education, and service. There were maybe a dozen lawsuits still active. And differences on the topic among alumni. But people can look at these issues and come to different conclusions, and they do. There’s one thing that is never in question and that is the love of alumni for this university, their interest in giving back and helping the university thrive and succeed. Mimi: And then comes along Beta Theta Pi. Lawrence: I've certainly been one of the key players, if you will, in the response. It's obviously a terrible, terrible tragedy that really shook everybody associated with Penn State. Of course, this is a national problem. President [Eric] Barron has led a strong response and the university is now a national leader, something that is increasingly recognized by the national media. Mimi: What's the difference in doing what you do in one of the largest cities in the country, compared to one of the smaller university towns? Lawrence: I think two things. Certainly, Los Angeles is a major media market and State College is closer to a central Pennsylvania [market]. In the digital age, that can be overcome if you develop a sophisticated digital organization. You can do media outreach from anywhere, really. Another difference is the strength of community at Penn State. The connection and love of the university is strong at UCLA, but there's something very special here. Alumni and the entire PSU community celebrate each other's successes, and that's great for communications, too. You have an army of alumni out there who are champions of the university. That's why I think we made up the right slogan for our marketing, which is “We Are.” I’m joking of course about making it up. It's authentic and it really encapsulates much more than the idea of sports. It encapsulates community; people feel a part of this place. Mimi: What's your biggest surprise about this job? Lawrence: I've really come to appreciate the one university idea, where you have campuses dotted all across the commonwealth. You have World Campus, which is one of the best online programs in the world, and University Park. The entire university supports different kinds of learners at different stages of their lives from different backgrounds. I didn't realize how unique that was. The scope is incredible, and it isn’t as well-appreciated as it needs to be. This is a truly unique university because of all that. Mimi: Have you had mentors along the way who have significantly impacted your skillset? Lawrence: Yes, I've been very lucky that way. The first woman I worked for, Judy Miller, was the first female executive at a Japanese multinational corporation. She handled international marketing. She led the fight for the ERA in California and she was the first woman to work in the Kingdom of Saudi Arabia. She had a remarkable background in politics and marketing in California, and was a creative force. [She] took interest in me as an intern in college and created opportunity for me. Another gentleman I had the pleasure to work for through Judy, a man named John Gavin, who was a former U.S. ambassador to Mexico. He believed in hiring the best people into an organization. He provided a vision, and allowed us the freedom to innovate and express our talents within that vision. He would support you no matter who your critics were or what obstacles you faced. He brought in a COO named Peter Dailey – they were very close. Dailey had built up the West Coast's largest ad agency. He was a U.S. ambassador to Ireland. He ran advertising for [Ronald] Reagan's 1980 campaign and he's in the UCLA football Hall of Fame. [In the past year, all three mentors have passed.] They all believed in providing opportunities. I was working at a very young age with remarkably experienced people who were ethical, full of integrity, and really gave me the support to grow and the confidence to try new things. I feel very blessed to have had that, and in a small way have tried to build a leadership style that accomplishes something similar for people who work for me. Mimi: [That way] you get a better end product. Lawrence: You get a better end product, you get happier people. You should enjoy your work. You should feel productive and creative, and that you are contributing to the success of an organization. It's really a very simple idea, but you really have to work to help people get there, and hold them accountable to high standards. Mimi: Before we part, I have to ask, what possessed you to go to college in Israel? Lawrence: I went on a youth trip to Israel when I was 16. I had relatives there that I'd never met. I really fell in love with the country. The next summer, a cousin of mine invited me back to his Kibbutz and I was flirting with the idea of living in Israel. I thought studying at the Hebrew University of Jerusalem might be a really interesting way to explore the possibility, and get a great education. It's the sense of adventure, to do something different, that brought me there. Mimi: What's your next big move here? Lawrence: This impact campaign we've created, we need to continue that, but then expand nationally. Now that we've tested it, we can see that we’re on track, so we need to think about scaling that to a national level. We also need to look at gearing up our communications strategies to support the university's global outreach and partnerships, and designated impact areas, like food, water, and energy security, which are among the priorities designated in the university strategic plan, which President Barron and [Executive Vice President and Provost] Nick Jones have developed. We need to orient our communication strategies to support those broader areas in ways that support everything from enrollment and faculty recruitment and retention to reputation growth and fundraising. Mimi: Thank you so much. Lawrence: Thank you. It was an honor to be asked. Thank you for having me.